Pleated blinds provide a warm, soft look to any room and are especially appropriate for use in conservatories. INTU blinds come in a large range of fabrics in a wide choice of beautiful colours and finishes. Many are available with ASC (Advanced Solar Control) backing which allows optimum control of solar heat and light, acting as a barrier to heat loss and offering protection from harmful UV rays. The pleated range also contains performance fabrics that have fire retardant, block out and dim out properties. 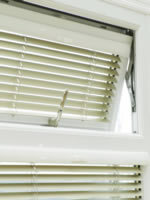 Cellular blinds not only look stylish, they actually help to insulate your home, thus increasing energy efficiency. The honeycomb design traps air, thus keeping rooms cooler in summer and warmer in winter, which is especially useful for conservatories. The unique construction means that there are no visible holes in the fabric giving it a sleek modern look. There are 11 fabrics in the Cellular range, 6 with standard shading and 5 rated as block out and all have a reflective ASC coating (Advanced Solar Control) to further prevent control heat loss. 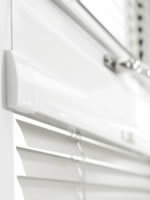 The design of the INTU Roller blind makes it particularly 'child safe', eliminating all hanging cord loops and chains. INTU Roller blinds can easily be installed in any home without the need for screws or holes, allowing them to be installed in minutes. Perfect for use in conservatories, the extensive range of fabrics gives you a wide choice of designs and styles to suit any room. INTU blinds are the safest blind you can buy. 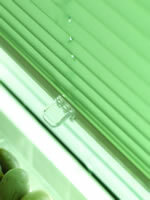 The most common cause of injury by window blinds is loose-hanging cord loops. Since INTU do not have any cords or loops they are completely safe for use around children or pets.